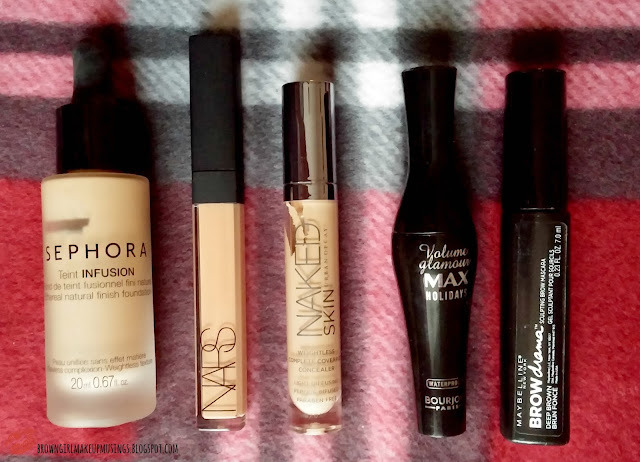 I can't create Top 5 lists without mentioning about my favorite face products now, can I? I wanted to talk about some of my favorite complexion-related products. I consider them my favorites because 8/10 times I will reach for these over the others I have (the 2/10 is for when I force myself to use the others). Disclaimer - I don't use foundation on a daily basis, but I do use concealers and mascaras almost daily (about five times a week). Sephora Teint Infusion Foundation (I wear the shade Walnut) - This is the most weightless and comfortable foundation I own. When I use it, I don't feel like I'm wearing foundation. It's got medium coverage, and it really evens up my skin but looks so natural. It gives a satin, skin-like finish and works well on my oily skin. NARS Radiant Creamy Concealer (I wear the shade Biscuit) - I gave into the hype and got this because I wanted to see what the hype was all about. Now I understand! It's a creamy formula, but blends out easily. The best part is that it's quite peach toned, so it actually corrects my dark circles. I also love the fact that it has really good coverage. I'm so in love with it, I'm trying to find a foundation with a similar formula! Urban Decay Naked Skin Concealer (I wear the shade Medium-Dark Warm) - All the hype around this sucked me in as well. It's a good concealer, thinner in consistency than the NARS on, but it has good coverage, blends out well, has minimal creasing on me (all concealers crease on me - I have laugh/smile lines around my eyes, so it's kind of inevitable). Wear time is good. I use this one on days I want a more brightening effect (it's not as peach-toned as the NARS one, so on days of really bad dark circles I have to use a corrector). Bourjois Volume Glamour Max Mascara - I had to bin this a couple of days after writing this post and I was so sad. This was a beautiful mascara and gave me long, volume-filled, luscious lashes. It managed to open my eyes up and make them look bigger, even if I didn't use a lash curler. I have yet to find a suitable replacement for this. Maybelline Brow Drama Sculpting Brow Mascara (I use the shade Deep Brown, review here) - At first the really strange ball-ended wand totally confused me - it looked like a miniature version of a medieval spiked mace! - but it quickly because a go-to in my routine. Since my everyday fuss-free routine consists of concealer, mascara, brows and lipstick, this is the product I use everyday on my brows. The wand is better suited for those with fuller brows, though - if you have sparse brows I'd tell you to avoid this one and look for one with a smaller wand. What were some of your favorite base makeup products this year? You'll notice I haven't mentioned any primers - I typically don't use primer, but I could use some recommendations! I'd love it if UD came out with more shades! Med-Dark Warm is a little too light for my taste and I'd love it if they came out with one a hint deeper. I have been loving Estee Lauder Double Wear in 4N2 Spiced Sand lately. Also LA Girl Pro. Conceal! The Double Wear is next on my list! I'm waiting to use up some of the foundations I have first. How do you like the LA Girl Pro Conceal? I haven't tried anything from the above, and to be honest I hadn't even heard about that Sephora foundation. But it sounds like something I would enjoy, so I will check it out next time I get to a Sephora.